If you are looking for a yummy fall-inspired dip to take to your next get together then you MUST try this Crock-Pot Apple Pie Caramel Dip it is to die for! Dip some cinnamon pita chips in this apple pie dip! With just 4 simple ingredients you can whip up this recipe in no time flat. Full of classic fall flavors it tastes like an apple pie with caramel drizzled all over it. While this recipe is not sugar-free it is low-fat and that counts for something right? Once you have your apples picked out the rest of the ingredients are simple…some cinnamon and allspice (you could also use apple pie spice instead) and a container of fat-free caramel dip (I used Marzetti Fat-Free Caramel Dip). 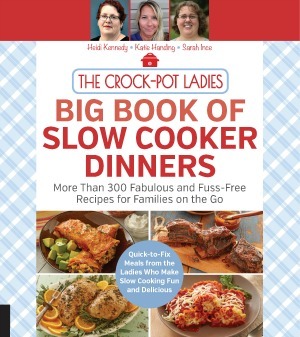 Toss all of that together in a 3-quart slow cooker and let it cook away for 4 hours or so on LOW until the apples are tender. 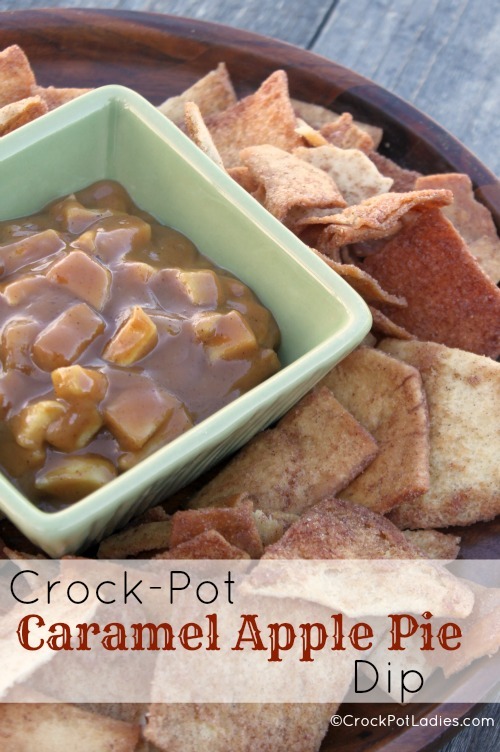 I served the slow cooker apple pie caramel dip with some cinnamon pita chips. But you could also use bagel chips, graham crackers, or whatever sturdy dipper you want! I even liked Wheat Thins for that salty/sweet flavor combination…so good! This super easy recipe for Crock-Pot Caramel Apple Pie Dip is a crowd pleaser and with only 4 ingredients it is quick to throw together. Peel, core and dice apples and place in the bottom of a small 3 quart crock-pot. Sprinkle apples with cinnamon and allspice and stir to combine. Pour fat-free caramel dip over apple and stir everything together. Serve with sliced apples, cinnamon chips, graham crackers or whatever your heart desires to dip into this yummy dip! That is weird. I have made this recipe several times and it has never curdled before. There is nothing in the recipe that I can think of that would curdle.